A most common misconception of today’s politically correct culture is the idea that God is everyone’s father. To be sure, the Triune God is Creator God. Without Him you would not be able to either hear or read this message. He created you. [Genesis 1:1-31 ; Colossians 1:13-20] But since sin entered the world through our distant ancestor, "Adam," we are consequently, all "sinners." [Romans 5:12] Hence, in our natural, sinful state, we are not "children of God," but rather, "children of Adam." The son in Christ’s parable of the “Prodigal [Lost] Son,” had left the family. He no longer wished to be part, but in headstrong fashion, moved out and demanded his share of the inheritance. He then in profligate fashion, wasted that monetary inheritance in sinful living. Finally, he came to his [spiritual] senses and ended up repenting. His decision of turn-around was [on the surface] prompted by his own self made deprivation and near destruction. He came home, fully admitting his sinful shame and was welcomed by a loving father. You, who have been brought up by good and, perhaps, godly parents – have you rejected them and their religious values? Have you been taught some basic “Christian” values only to have embraced ever changing cultural values and norms? Have you wandered from your simple childlike faith in Christ and allowed your interests to be enamored with [supposed] Darwinian “scientific” “truths?” Have you allowed a certain cultural lifestyle to siphon away any semblance of shame as you march independently headstrong into what you think is fashionable living to be admired by all? 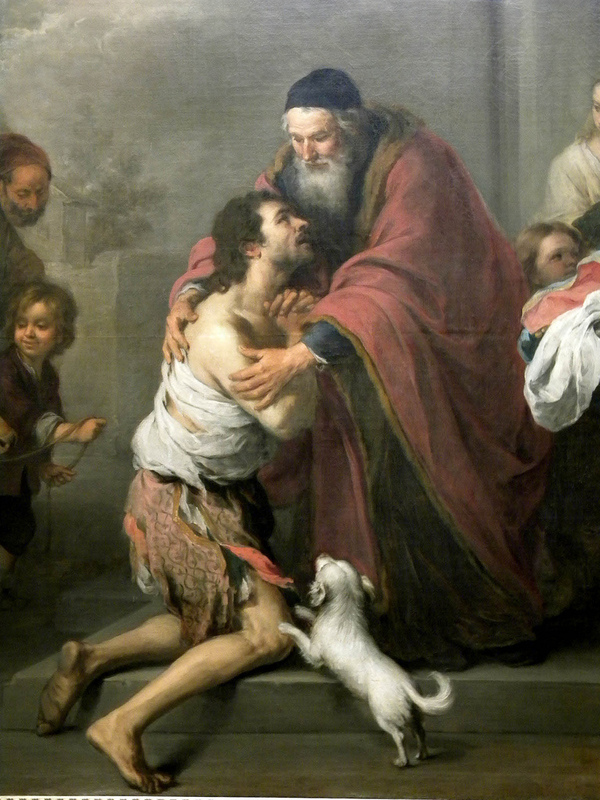 If you have shared some traits, such as the Prodigal Son, there is hope for you. You can return to a loving heavenly father who yearns for your return. He will not force you to return. He will not take back the free moral agency which he has granted you. He will respect your “right” to deny him and pave your personal way to perdition. repentance and faith in Christ. How can one return to a loving Father and loving family if one has never belonged? Such is an impossibility. You find yourself grappling with life’s umpteen problems and overwhelming cares and concerns. You are like the proverbial, canoeist, up the creek, without a paddle. And, you are being pushed and forced by an overwhelming current, downstream to a certain waterfall death. Nowhere in the Scriptures will you honestly find a self-help manual for you to pull yourself up by your own sinful bootstraps and make your sinful soul clean before a sinless (holy) God. The Triune God will not allow His heaven to be contaminated by sin. You are either cleansed in the precious sacrificial forgiving blood of the sinless Christ or you are headed for an eternity without God and without all that is holy and perfect. Not the labor of my hands; can fulfill Thy law’s demands. Could my zeal no respite know, could my tears forever flow. All for sin could not atone; Thou must save, and Thou alone. This author's short story of his mother's Christian "testimony:"
"When did you become 'saved?'" "How do you know that you are 'saved?'" "How do I know that I'm saved? Because I believe God's promises!" That Scriptural promise from John 3:16 is most blessed! It's sealed in the Savior's blood. It's not dependent upon our own will and doing - Ephesians 2:8-9; John 1:2-13, James 1:18. It's a divine guaranteed promise for believers because it is dependent upon holy heavenly Father! Christian Faith -- How does a soul acquire it? The True God -- Both "Creator" and "Triune"